At the beginning of 2018, we were preparing to deliver the most transit-dependent Super Bowl in the event’s history. And that’s what we did, providing hundreds of thousands of extra rides on our way to setting monthly ridership records on each of our rail lines. The success we found early in the year is among the top highlights of the past year. But it is but one of many accomplishments that should be celebrated as we look back at the last 12 months. > Continuing to deliver reliable service on Interstate 35W amid one of the largest and most impactful road construction projects in state history. > Introducing new limited stop service on St. Paul’s East Side, boosting average weekday ridership on Route 54 by about 1,000 rides. > Completing a three-year effort to replace 12,000 bus stop signs across the region, providing customers the information they need to make informed choices. > Breaking ground on a long-awaited, $25 million overhaul of the Mall of America Transit Station. > Providing 83,500 rides to and from the Minnesota State Fair on Labor Day, setting a new single-day record. > Surpassing the 1 million mile mark on our original fleet of light rail vehicles. > Launching a bus operator apprentice program to support our newest operators during their first year on the job. > Expanding the Transit Assistance Program, which allows eligible customers to ride any time for $1 (participants took more than 1 million rides in less than a year). > Building consensus around a bus operator barrier that will be installed on up to 600 buses in the future. > Installing around two dozen new bus waiting shelters, part of an ongoing effort to expand and improve our shelter network. Amidst all this work, we also renewed our focus on recruiting bus operators, reaching further into the community to form partnerships and finding new ways of to support applicants. The year will also be remembered for setting the stage for what may be the most ambitious period in our organization’s history. In December, we learned that construction costs for the METRO Green Line Extension would be eligible for federal reimbursement pending a Full Funding Grant Agreement. We also secured the funding we'd sought to build the METRO Orange Line and bring Bus Rapid Transit Service to I-35W. Work on each of these projects will be underway next year. With stations built and buses on their way, we’re also poised to open our region’s second urban Bus Rapid Transit line, the C Line, and to put our first electric buses into service. Thank you for riding with us, challenging us to do better and making 2018 another remarkable year. We look forward to serving you in 2019. Growing up in Cambodia, Soonem Teng’s family fled their home several times to escape raids by the Khmer Rouge. That experience helped point Teng toward a career in law enforcement. On Thursday, he was among 16 new officers sworn in by the Metro Transit Police Department. Teng’s experience was not uncommon among his peers. Several of the department’s new officers grew up during warfare in faraway lands, became refugees and were befriended at some point by police officers. In addition to Teng, who speaks Cambodian, the new group includes officers who speak Burmese, Chinese, Somali, Spanish, American Sign Language and Igbo, a West African language. Ahmed Dualeh was born in Somalia while the country was in the throes of a civil war, an experience that led him to see police as peace keepers. Dualeh’s outlook has also been formed by his time at a Ramsey County Corrections Officer. As a police officer, he hopes to be a positive force before troubles mount. “I can talk to younger people and help them by being a role model,” he said. The new group of officers also includes former security guards, volunteer police reservists, military veterans and Community Service Officers. The department gained its first sibling duo, too. Kevin McCabe’s older brother, Pat McCabe, has been with the department since 2014. 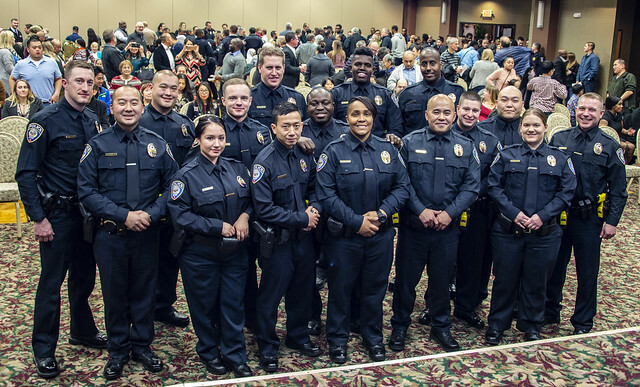 With the additional officers, the Metro Transit Police Department now has 101 full-time officers and 59 part-time officers. The new group was brought in partly to support the C Line, a Bus Rapid Transit service replacing Route 19 in 2019. Before Thursday’s swearing in ceremony, the recruits completed the department’s custom, 10-week academy and spent another four months working alongside field training officers. Metro Transit police officers can respond to calls from throughout the seven-county region but primarily focus on patrolling the transit network. After working 20 years in a few different industries, I found myself laid off from my management job at a big box home improvement store. After hearing my story, a member of my church and retired Metro Transit employee, Alphonso Gayle recommended that I apply to be an operator. I followed his advice and the rest is history. My first job was as an operator at the Nicollet garage. After three years, my managers recognized my potential and I became a relief instructor. I served in this role for two years until I was recently promoted to assistant transportation manager. Nine months and counting, you can find me at South Garage serving in this position helping plan and manage bus operator performance. I’m responsible for ensuring timely and safe delivery of bus transit services within the region. I was born in Minneapolis and lived here most of my life. I grew up in a minister’s home and thought maybe I’d follow my father in church work. But, after becoming an ordained minister, I found that I wasn’t that good at it. While I didn’t glean my father’s talent for ministry, what I did take away from my childhood was how to fix things. In a small church, we had to fix everything ourselves. He taught me to do floors, walls, windows, doors, heating, cooling, finish carpentry, rough in carpentry, trim work, cabinets and countertops, mechanical, and electrical. So, that has come in handy throughout the years when I had work to be done, when someone else needed help, or in one of many careers I’ve held through the years. I love people. I enjoyed driving the bus and meeting all the passengers. And now I am getting to know the 250 plus drivers at South Garage. I really enjoy working in a place where I can positively affect the community of the council, one operator at a time. I’m a firm believer that if you are in trouble or have a need, there is help if you know you have a problem and want to change. I was taught early on to correct in private and praise in public. I enjoy helping others – it brings me joy. It’s why I enjoy playing the part of Santa Claus, making appearances all around the city at parties, charities, and even on Metro Transit buses and light rail. Seeing the kids’ faces when I enter the room is priceless. And even when I’m not wearing the costume, I take my role as Santa seriously. It’s probably why I find myself busy making little toys for the children in my workshop. Outside of my seasonal alter-ego, I also enjoy being outdoors, hunting, fishing, and working at our family cabin on the tractor. I enjoy having a cup of coffee with friends and family playing games and making memories. I enjoy a good hot sauna in the back yard. I also enjoy tending the garden. I have pear, apple and cherry trees; red and black raspberries; rhubarb; blueberries; and grapes. To help the environment, I am also an Apiarist and have twelve bee hives. As the METRO C Line pivots from construction to operations, staff at Heywood Garage got their first look at the future of bus technology – an electric bus charger. This is a temporary installation, but a necessary first step towards familiarizing and training staff on its operation before the delivery of the first 60-foot articulated electric bus in January. Eight permanent charging stations will be installed in Heywood Garage, one for each of the eight electric buses. At Heywood, bus batteries will be charged to capacity overnight, taking about four hours. During a route, operators will receive a range-extending charge at the on-route chargers, taking about ten minutes time. Eight permanent chargers will eventually be installed in Heywood and two at the Brooklyn Center Transit Center. The C Line is expected to launch in the spring of 2019. Metro Transit plans to eventually electrify our entire fleet.